I wrote about how to use advance search to look for classical music on Spotify before; Spotify's official site also offers various examples of wildcard searches. 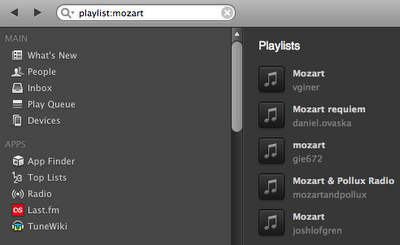 Today I discovered a hidden feature in Spotify's desktop app: playlist search. I browsed the five results in the first page, they are all quite popular (8k+ subscribers), but strangely, no playlists from Pitchfork's official account was shown in the first ten pages of results (even though this one has 35k+ subscribers). Apparently, the reason is, there's no "pitchfork" in the titles of those playlists. Here begins the confusion. It shows a list of seemingly random playlists - many of them have no subscribers at all. I am not going to browse through a list of playlists titled just Mozart unless I'm really bored, and I doubt many users will. I didn't see my Mozart Chronological Catalogue playlist (800+ subscribers) in the first 10 pages of results, and couldn't find anything when I searched for "Mozart catalogue". My intention was to find out if other users could find my 1,000 Recordings To Hear Before You Die Based on Tom Moon's Book playlist (1.7k+ subscribers) through playlist search. The answer is negative - it only shows dozens of playlists consist of only one album: Tom Petty's Full Moon Fever. This brings up another problem in Spotify: the unwanted one-album playlists. Why would users create a playlist for a single album? Because they have to; there's simply no other way to save an album for further listening. Playlist management is always a weakness in Spotify, after a user created dozens or hundreds of playlists, it becomes really hard to look for or even remember what's in the library. Creating a "favourite albums" playlist partly solves the problem, but I think Spotify could add a simple function that vastly improves the user experience, for now I call it My Collection. We create and subscribe to various playlists for rainy days, parties, holidays, etc., all tracks in those playlists go into our Spotify Library, but I think many of us also treasure the notion of a personal music collection, consists of only the albums/tracks we really think as "our music", i.e. those we would buy before music subscription comes into being. What I suggest is: add an "Add" button for tracks, albums and even artists, and show music added to My Collection is grid view, as in Devices (see image below). I don't think it's the same as Starred tracks, which would become hard to browse after I added in hundreds of albums; it also cannot hold more than 10,000 tracks. For unknown reasons, users can no longer star an album in the latest version of Spotify. This Collection function also creates useful stats for Spotify: how many users added a particular track/album to their collections; how many followed (added to collection) an artist. They can also add another handy function here: show new releases/newly added recordings from an artist to their Spotify followers as a unread (unheard?) count in their icons in the grid view. How many times did we stumble upon a promising release from an unknown band every year, and how do we keep track of their follow-ups? Why do I need a 3rd party service to tell me a new Radiohead or Leonard Cohen album has become available on Spotify? This function improves user experience, as well as offering the musicians a chance to gain loyalty, other than one-time exposure. I think Spotify is still working on playlist search (hence the hidden-ness); hope it becomes a truly useful function soon. This is something I have been wanting for quite a while now. I am one of those people - my 'collection' is just a bunch of one-album playlists. Something I noticed while I was checking out the searches you posted. If you type Tom Moon and then click on the search area to use the instant searching function, your playlist is shown in the playlist list, but if you click "show all results" your playlist is no where to be seen, and only shows the results you saw. Sounds reasonable, must be something similar to that, I am not subscribed to any of your playlists, I found your post via a retweet by @afront. Also searching for Sea or Number doesn't bring up your playlists and some of those playlist's in the list with those searches have no subscribers at all. Anyway starting to go off the topic a bit now. just thought it was interesting that your playlist did come up in the instant search area.